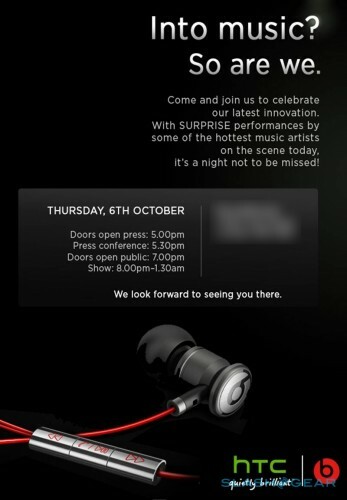 HTC has announced that it will be holding a press event on October 6 to out the new Beats Audio equipped smartphone. The event will be held in London and will include a party that is open to the public. The HTC event doesn’t hint what specific smartphone will be the focus, the image is simply showing a Beats Audio headset. Our man Chris Davies suspects that the smartphone at the event will be the Runnymede also known as the HTC Bass. We spied that gem of a smartphone on video not too long ago and it looks good. We have few hard details at this point on the Bass/Runnymede smartphone, but it is thought to have a 4.7-inch screen, an 8MP camera, and use HTC Sense 3.5. There are more details on the event on the HTC UK Facebook page including the location of the event and how you can get tickets. There will be 1,001 tickets available with some sort of contest to determine who gets tickets. The flyer about the event notes that there will be surprise music guests with some of the hottest artists on the scene.